We are excited to participate in National Cohousing Open House Day and welcome our neighbors to see what we are all about. We will show you the 3 types of homes in Quimper Village, our Common House, wood shop, art studio, and other common areas. PARKING IS VERY LIMITED and we encourage biking, hiking, carpooling or taking Jefferson Transit, which has a stop nearby. We are located in Port Townsend at 3105 Sage Lane, near the intersection of "F" Street and San Juan Avenue, next to Colinwood Farm. Directions can be found here. Since December, we’ve baked, boiled, blustered and blundered our way through more than FORTY (40!) community dinners and have our very first brunch on the schedule. Despite a couple of minor fires and Insta-pot malfunctions, brave and inventive chefs and crews have stepped up to try their hand at cooking for a crowd. Translating a recipe that was written for 2 or 4 people into one that will feed 30 is both art and science. As we have seen by the leftovers, just multiplying the recipe doesn’t work. We often cook t oo much, sometimes not enough. We have created our own educational opportunity - Kitchen 101 (102 is coming soon) where we gather and share food safety tips, quantities of food, safe use of kitchen equipment, and favorite recipes. Our QV recipe book is a collection of some meals that have worked well so others can use it as a guide. 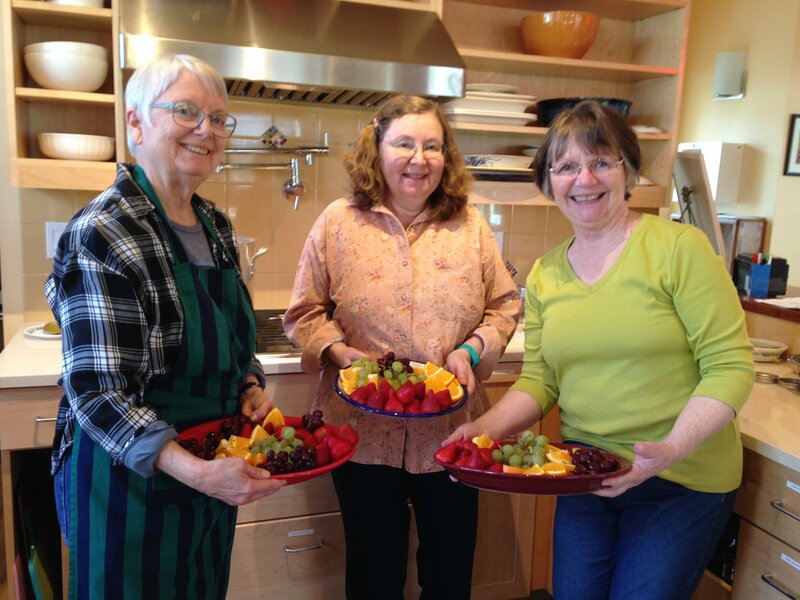 For a group that claims common meals are all about community, we sure do enjoy the food! From simple to complex, dancing through the needs of vegans, paleos, omnivores, allergies, sensitivities, and preferences, we have enjoyed a great variety of delicious meals. Although we haven’t found the perfect meal that feeds all, we are adapting, learning to offer options and if the meal doesn’t work for you, just bring your own and enjoy the company! We have found great sport in the after dinner tossing of the napkins. One brave soul walks among the tables collecting napkins with a laundry basket and suddenly we become a cross between March Madness and a middle-school cafeteria. 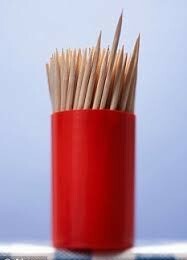 After dinner, and the napkin toss, some may head for home and some may grab a toothpick and stay and chat for a while. And, what is the one thing that is ALWAYS for dinner? Laughter!! of the virgin birch forest. Yet, I am the humblest of utensils. before I am spat into the street. For all of us: New stove, new pots and pans, new utensils, new KITCHEN. Here, Bill is making sure he's got the flame where he wants it. 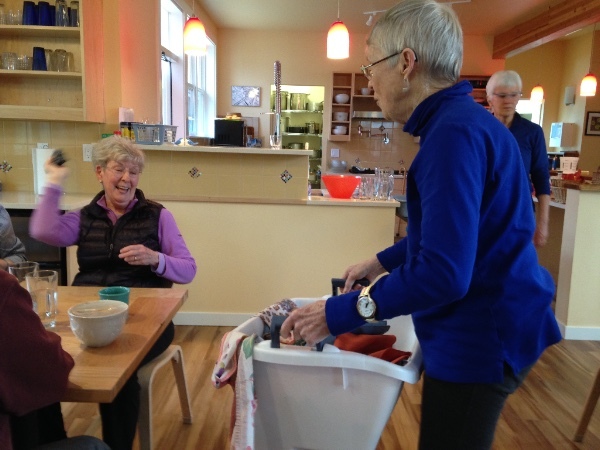 What do you do when you’re moving from a big house to a smaller home at Quimper Village? You downsize, of course. What do you do when you’ve still brought more stuff than can fit in your new home? You have a garage sale! 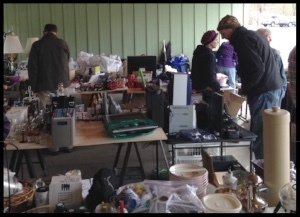 And that’s what we just did - a 28 family garage sale with all sorts of items from furniture and fixtures to games and gizmos. Despite wind and rain, many people showed up to find their treasures and give them new homes. 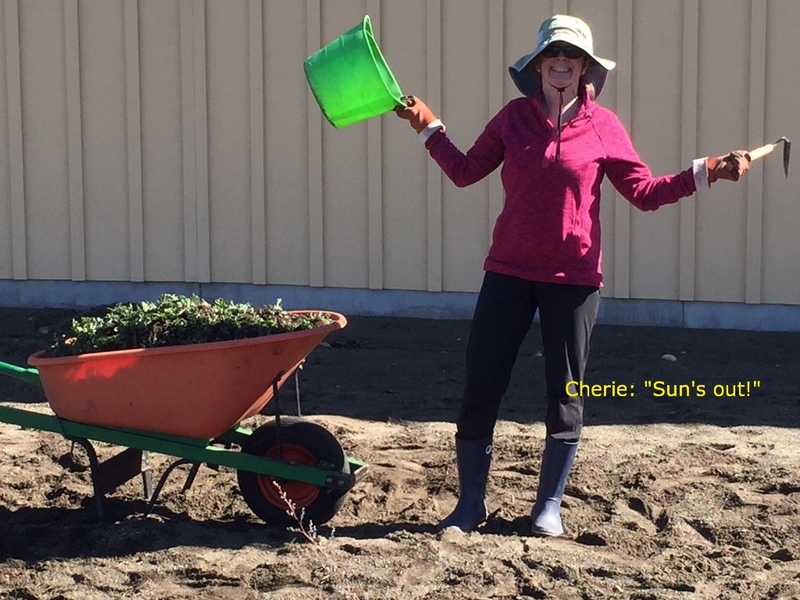 With the $3,245 net proceeds, we happily donated $645 to the Port Townsend Food Bank and will use the rest to beautify our village with new plants, trees, bushes, and flowers. Now that we’ve freed up space in our homes and our storage units, we feel more spacious, more gracious and more lighthearted. Spring is coming, and I’ve heard several members expressing interest as to when the master landscaping plan will be out and when they can start planting in common areas next to their houses. So, at 10 a.m. on March 15th, I wandered over to the Landscaping Expo in the Common House to get some answers. Tables were covered with printouts of information on various plants shrubs and trees appropriate for different areas in the village. One table held reference books on flora common to the Pacific North West. Another table held diagrams of our 6.2 acres showing common areas that can be planted and common areas that must be maintained as open meadow. Twenty-five percent of our land is mandated to remain open space, according to our sale agreement. Also at that table were surveys asking members for suggestions. Jeanette, Doug, Anne, Mike and Nancy were standing by to answer questions, and coffee and scrumptious chocolate cookies were provided for all. Doug stated that the Master Plan for landscaping should be ready by late April and that ornamental cherry trees will be considered for Sage Lane, the entrance to our property. Anne, our resident landscape architect, will put out guidelines before then regarding common areas next to individual units. 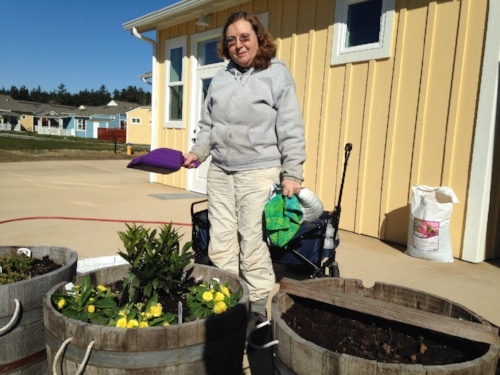 These will encourage native plants, deer resistant plants, and drought resistant plants. No trees or plants should be taller than 15’ at maturity, and all plants should avoid shading windows. He/she who plants is responsible for the plant’s upkeep. The team is reluctant to discourage any reasonable planting in common areas adjacent to members units and acknowledged that some members had already started. --- Quimper Village: a little history, without worrying too much about dates, and with just a little imagination here or there because it makes a better story. In other words, history the way it should be, as described, mulled over, sometimes invented just a little, by Jack Salmon. This article was written in July 2015. Back around 2012, more or less, David Hundhausen had a bad fall. Over the next year or so, some complications arose and he began having difficulty getting around. This started Pat (his wife) and David thinking about what to do to make their lives a little easier as they aged and other parts started to break or fall off. 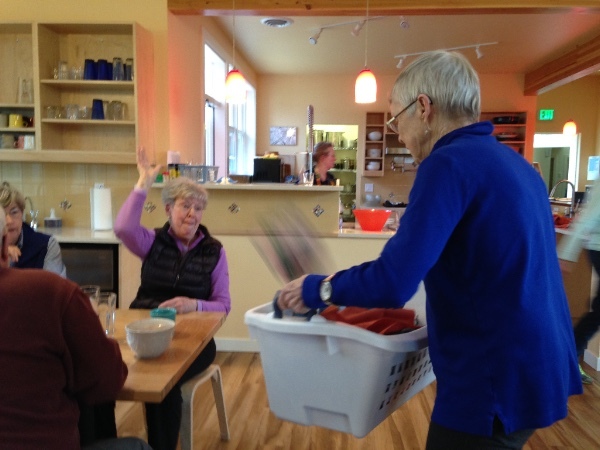 Along about Fall of 2013, Pat ran across the concept of “cohousing” and got all excited. 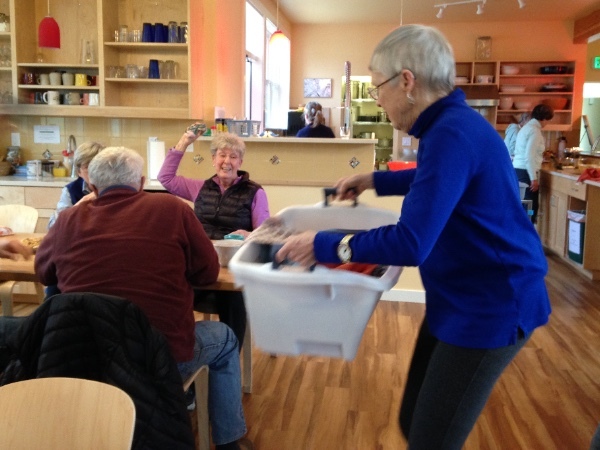 It was all about older folks deciding to get together as a community and make their own way to live, helping each other out during difficult times, and having fun together. Couldn’t be all bad, right? QV Seniority #1. Away we go! Since then a lot has happened. I’m going to try to write down some of it like real historians do, with actual dates and boring quotes from Minutes or something, but that can wait. The really interesting and important stuff is in the evolution of QV: how does our group work, and why does it work, and so what? The why is easy to describe, but not so easy to understand because it looks different from inside than from outside. The secret sauce is, as Chuck Durrett and Katie McCamant told us, a sense of community. And I don’t know about you, but that flat astonishes me! Something happened over the three months as we read our books and met nearly every week to talk about what we were learning and feeling. I originally signed up for the course because I was curious, but mostly so I’d be there to keep my wife, Carolyn, from doing something silly, like buying that do-gooder idealist line about community spirit. That sort of thing never works, as all we hard-nosed realists know. Dumb idea. So I went along with her, and sat there with a briefcase full of powerful arguments against the whole thing. I was wrong. The Good Fairy whacked me with her sparkle-stick or something. I got all gooey and community-ish. Embarrassing, and don’t tell anybody I ever said it. But Carolyn and I were the next to invest: QV Seniority #2. I think the biggest difficulty experienced by new members joining as we go along is learning how deep the community-mind goes among we pod people of the Good Old Days. At least they do until they too find themselves sliding down the slope into the goo-pit. Then they stop wondering and start enjoying the warm bath. Welcome, and please scoot over just a bit for the next folks coming down the slope. QV is based on the proposition that we’re all in this “aging” thing together, that it’s not for the weak, that we’re therefore all strong, and mostly that we’re all in this thing together. It’s worth saying that twice. We started on a project to buy several acres of land in Port Townsend and to build 20-plus houses (now 28) that we could live in. There were just a few of us old folks, none of us with serious experience as real estate developers, and here we were starting a project that might cost five, or six, or eight or ten MILLION dollars before we were done! Obviously we were nuts. And to make it work we’d have to find another 30 or so equally crazy people. So why did we keep tossing perfectly good money into the pit? Because we trust each other, and we really want to make it work. We learned to like being around these crazy people, we have fun with them, we get things done together, and every time we manage to stumble around and do something important, that convinces us that it really does work, it will work, and one day we can sit in the sun on our Common House patio and tell each other what fine fellers we all are. I say again, we trust each other. And it’s that community-mindedness, the trust, that Associates have to learn about, and that we hope our new Members are internalizing, because it’s the glue. We know that the well-being and growth of the community is a value worth supporting, so we trust each other to make the decisions necessary to help move us along, to negotiate for the land or talk to the bankers or fuss with the lawyers and pick sinks. We all have our different perspectives, our favorite colors or countertops or windows, but if most other members really want something different we’re willing to take one for the team — not go home and sulk, but go home and say “well, I can live with that since Joe and Sue will still be there.” We don’t vote — that would be sort of shameful, oddly enough. We “consent” (that’s one word I really hate, but I’ll take one for the team). That means we talk about something, see what most of us want, see if we can improve it a little, compromise here or there, and then say “okay, good enough.” And we go on. Chuck and Katie are both amazed at how far and how fast we’ve come. We’ve been doing this sort of thing now for over a year. We’ve bought land, hired architects and lawyers and engineers, some of us are talking to banks about construction loans and guys with bulldozers about shoving dirt around — and we’re up to nearly 20 sufficiently-crazy individuals or couples to keep going. Yeah, it works. It’s nuts, and nobody quite understands it, but it works. And so we go on, heading for the finish line and that spot in the sun. The Port Townsend Marine Science Center (PTMSC), located at Fort Worden State Park, was begun 35 years ago by two dedicated women, Judy D’Amour and Libby Palmer, and run entirely by volunteers. Today PTMSC has 7 full-time employees, 4 part-time employees and 4 AmeriCorps young people who work full-time. They have about 200 active volunteers each year according to Marketing and Development Director Liesl Slabaugh. Besides hands-on educational exhibits, the organization provides summer camps for kids from pre-school through age nine. The kids spend time exploring sea life, coastal plants, and a wide variety of coastal environments. The Science Center also provides a special link with the schools, offers a lecture series, and partners with local maritime businesses for cruise opportunities to Protection Island, a wildlife refuge. One of the aims of the organization is to provide citizen science opportunities for the general public. 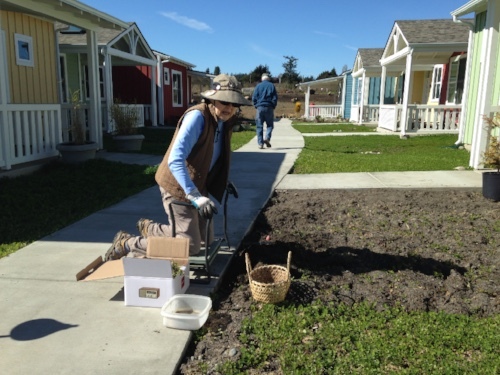 Jane, a Quimper Village resident, took up the challenge of being trained under the citizen science program. She volunteers her time each week, concentrating on two areas. 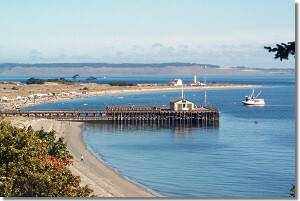 One is as a monitor of settled water samples from four different sites in Jefferson County: Mystery Bay, Discovery Bay, Fort Worden and the Port Townsend waterfront. Other volunteers collect the samples while Jane and another volunteer scan the samples for harmful phytoplankton, the microscopic plants that carry the toxins causing shellfish poisoning in humans. The results of their findings are then sent to the National Oceanic and Atmospheric Administration (better known as NOAA). If the resulting numbers become too high, NOAA then reports the dangerous levels to the Health Department. As an English major in college, Jane often wished that she might have pursued science instead. The Marine Science Center citizen science program gave her that chance. Besides mo nitoring the toxin levels in local waters, Jane also has the opportunity to clean the hands-on tanks in the marine exhibits. “It gives me a chance to get to know and observe the critters and what they’re doing.” The tanks, holding sea urchins, sea stars, a variety of small fish and other sea creatures, are open and available to the public. Jane gets to know the sea life and their habits up close and personal. 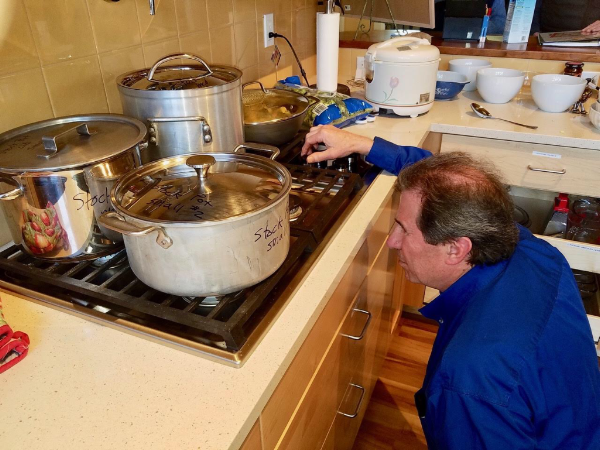 A woman of many interests, Jane also puts together a PowerPoint presentation of auction items each year for the organization’s major Tides of March Benefit Dinner and Auction. 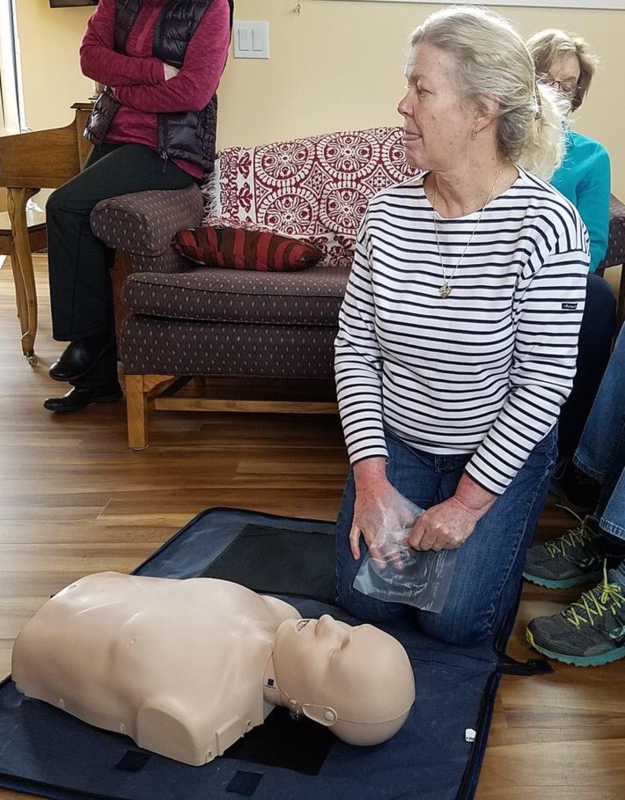 Our wonderfully active Health and Safety Team arranged a training in some life-saving techniques. 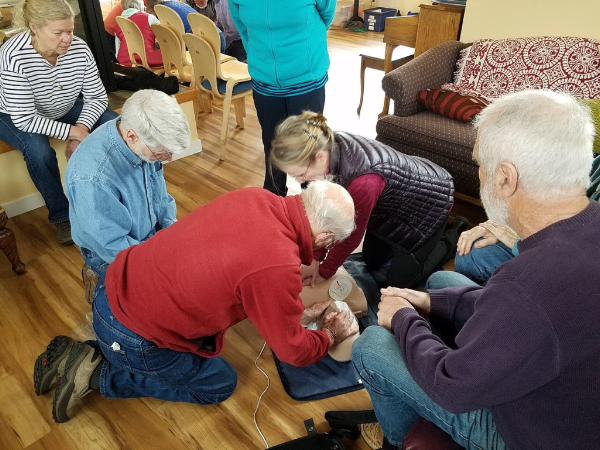 We have an AED in the common house and several members are trained in CPR. 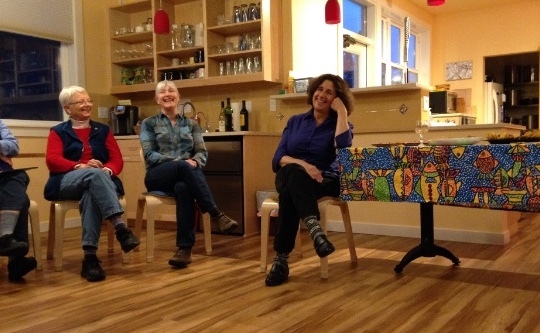 We were pleased to host Katie McCamant for an evening of talking about the joys of community living. Katie was instrumental in the success of building Quimper Village in record time. She updated us on her 500 Communities Project. 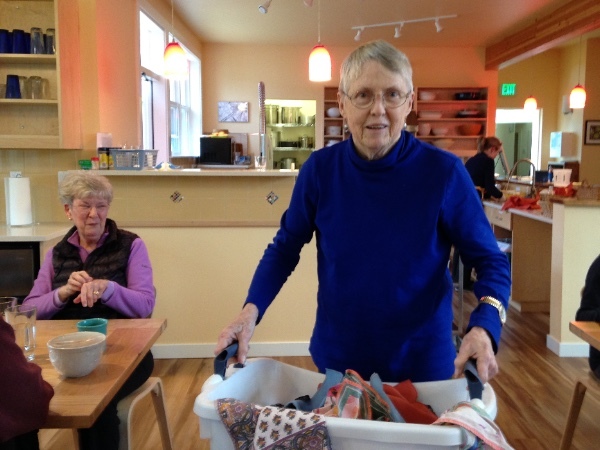 Quimper Village and McCamant & Durrett Architects are joining forces to host the 2018 Senior Cohousing Conference in western Washington in June. Stay tuned for details. Copyright © - 2018 Quimper Village, All rights reserved.